Travel between Nova Scotia and Newfoundland with your car means a long ferry ride. If you don’t have a vehicle, it’s easier and quicker to fly between the Newfoundland capital Saint John’s and Nova Scotia’s capital, Halifax. 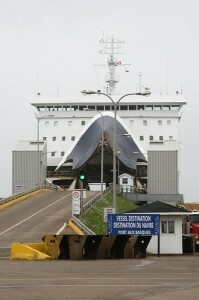 Marine Atlantic operates the ferries between Nova Scotia and Newfoundland, including Canada’s largest ferry, the MV Caribou. The boats leave from North Sydney, a small community on the northern tip of Cape Breton island. It takes 5-1/2 to 7 hours for the trip to Port-aux-Basques, on the west coast of Newfoundland. You’ll pay $28 per adult plus $79.50 for a car, plus a 25% fuel surcharge. It runs year-round and there are usually at least 2 sailings a day in both directions. In peak season, there can be as many as 5 daily departures to choose from. To reach Argentia, the port just below Newfoundland’s capital city of Saint John’s, you’re in for a marathon 17-hour journey. You’ll pay $78.50 per adult plus $163.25 for a car, plus a 25% fuel surcharge. The ferry only runs between late June and late September. It leaves Newfoundland on Tuesdays, Thursdays and Saturdays and departs North Sydney on Mondays, Wednesdays and Fridays. Reservations are strongly recommended, especially if you’re travelling with a vehicle, but you can always turn up to see if there’s room on the next boat. With a reservation, you should be there 1 hour before departure. If you haven’t booked, you should be there 3 hours ahead of time. Once on board, you can have a meal in the cafeteria, watch a movie or take the kids to a play area. Food can be expensive on the ship so if you’re on a budget it pays to pack a lunch. Don’t forget motion sickness pills, especially if you’re travelling in the winter when rough seas are more common. It’s worth booking a place to relax. A semi-reclining seat costs just $9.25 and you can have a bed to call your own for as little as $16 in a dorm. You can also take your cat or dog along. Little Fluffy will be put in a free kennel provided by the ferry company.